My classmate, Jessica and I leading a learner-centered nutrition lesson on "Longevity" at Golden Gate Senior Center. Focuses on the scope and nature of work in the nutrition field, including higher education pathways, career opportunities, professional roles, skills, responsibilities, ethics. Includes guest presentations by various nutrition paraprofessionals and networking opportunities with registered dietitians. A practical approach to the study of nutrients with emphasis on their physiological roles, food sources, and health implications. Basic principles and tools for planning a healthy diet, and nutrition issues of current interest will be analyzed. A study of the cultural and socioeconomic influences on the food habits of different ethnic groups in the United States and their diet-related health risks and implications. Cross-cultural counseling strategies, food service sanitation and safety, and optimal use of food dollars will also be covered. Studied the nutritional needs and special nutrition concerns throughout the life cycle; nutrition screening parameters for each age group; motivational interviewing and counseling techniques. Learned basic principles of medical nutrition therapy and relationship of diet and disease; and principles of nutrition in public health with an emphasis on learner-centered nutrition education and community resources. 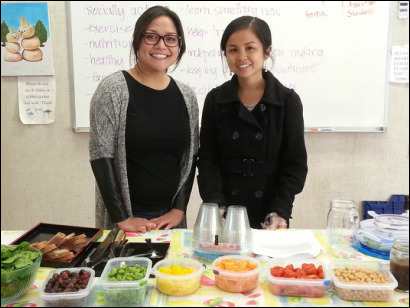 A total of 160 hours (minimum) practicum training under the supervision of nutrition professionals at various public health, community, or health care settings in the San Francisco - Bay Area. Achieved core competencies in: nutrition screening and risk assessment, nutrition education, nutrition counseling, intercultural communication, customer service and communication skills, food service sanitation and safety, community resource referral, and job-specific computer skills. "Recipe for Success: Integrating Academics & Nutrition"
"A Call to Action: Improving Nutrition, Physical Activity, & Learning"